Mccloskey, W. B. (2017). Weeds. In Arizona Master Gardner Manual, First Edition, Publication AZ1738 (pp 377-408). 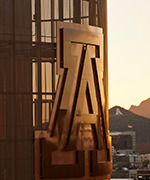 Tucson, Arizona: University of Arizona Cooperative Extension, Arizona Board of Regents for The University of Arizona. Chapter discusses managing weeds in Arizona urban landscapes (contains over 15,000 words and 25 figures). Liu, J., Bronson, K. F., Thorp, K. R., Mon, J., Badaruddin, M., Mccloskey, W. B., Ray, D. T., Chu, Q., & Wang, G. (2014). Lesquerella seed and Oil Yield Response to Split-Applied N Fertilizer. Industrial Crops and Products , 60, 273-279. This is work from the Lesquerella grant that I am the PI, and Sam Wang was the Corresponding Author. Dierig, D. A., Wang, G. S., McCloskey, W. B., Thorp, K. R., Isbell, T. A., Ray, D. T., & Foster, M. A. (2011). Lesquerella: New crop development and commercialization in the U.S.. Industrial Crops and Products , 34(2), 1381-1385. Kuepper, A., Mccloskey, W. B., Manmathan, H., Patterson, E. L., Nissen, S. J., Haley, S., & Gaines, T. A. (2016, February 8 - 11). Population Genomics of Glyphosate-Resistant Palmer amaranth (Amaranthus palmeri) Using Genotyping-by-sequencing (GBS).. In Weed Science Society of America Annual Meeting . Throughout the southeastern and southwestern United States, populations of Palmer amaranth (Amaranthus palmeri) have been identified with evolved resistance to the herbicide glyphosate. This project aims to determine the degree of genetic relatedness among a set of glyphosate-resistant and –susceptible lines by analyzing patterns of phylogeography and diversity on an intraspecific level. Seven different lines of Palmer amaranth from different geographic regions were tested against a glyphosate-resistant line from an Arizona locality for glyphosate resistance. The goal is to ascertain whether resistance evolved independently in the Arizona locality, or whether resistance spread from outside to the location. For example, the transportation of resistant seeds in harvesting equipment could be a source of gene flow via seed migration. The accumulation of shikimic acid and EPSPS copy number were tested to confirm resistance. The susceptible lines showed an average of 41 mg/ml shikimic acid accumulation while the resistant lines showed an average of 0.1 mg/ml after exposure to a 500µm solution of glyphosate. Individuals from the Arizona glyphosate-resistant locality had increased copies of EPSPS in the range of 20 – 290-fold. This is the same mechanism previously identified in the Palmer amaranth lines from the southeastern US, therefore it is possible that resistance was introduced from elsewhere. DNA samples were collected for genotyping by sequencing (GBS) to perform single nucleotide polymorphism (SNP) calling, which will be used to determine the genetic structure of the different lines. Currently, neighbor joining trees and principle component analysis are being performed. This information about the evolution and migration of glyphosate resistance will be useful to design better strategies for herbicide resistance management. Kupper, A., Mccloskey, W. B., Manmathan, K., Patterson, E. L., Nissen, S. J., Haley, S., & Gaines, T. A. (2016, March 7 - 10). Population Genomics of Glyphosate-Resistant Palmer Amaranth (Amaranthus palmeri) using Genotyping-by-Sequencing (GBS).. In Western Society of Weed Science Annual Meeting , 69, 74-75. Throughout the southeastern and southwestern United States, populations of Palmer amaranth (Amaranthus palmeri) have been identified with evolved resistance to the herbicide glyphosate. This project aims to determine the degree of genetic relatedness among a set of glyphosate-resistant and –susceptible lines by analyzing patterns of phylogeography and diversity on an intraspecific level. Seven different lines of Palmer amaranth from different geographic regions were tested against a glyphosate-resistant line from an Arizona locality for glyphosate resistance. The goal is to ascertain whether resistance evolved independently in the Arizona locality, or whether resistance spread from outside to the location. For example, the transportation of resistant seeds in harvesting equipment could be a source of gene flow via seed migration. The accumulation of shikimic acid via the shikimate assay and EPSPS copy number and were tested to confirm resistance. The susceptible lines showed an average of 41 mg/ml shikimic acid while the resistant lines showed an average of 0.1 mg/ml shikimic acid accumulation after exposure to a 500µm solution of glyphosate. Individuals from the Arizona glyphosate-resistant locality had increased copies of EPSPS in the range of 20 – 290-fold. This is the same mechanism previously identified in the Palmer amaranth lines from the southeastern US, therefore it is possible that resistance was introduced from elsewhere. DNA samples were collected for genotyping by sequencing (GBS) to perform single nucleotide polymorphism (SNP) calling, which will be used to determine the genetic structure of the different lines. Currently, neighbor joining trees and principle component analysis are being performed. This information about the evolution and migration of glyphosate resistance will be useful to design better strategies for herbicide resistance management. Mccloskey, W. B. (2016, February 8 - 11). Dicamba-Glufosinate Interactions and Weed Control in Desert Cotton.. In Weed Science Society of America Annual Meeting . Long-term use of glyphosate in Roundup Ready Flex cotton in Arizona selected for glyphosate tolerant weed species and glyphosate resistant Palmer amaranth. Dicamba, glufosinate and glyphosate (DGT) resistant cotton varieties were developed to provide an additional weed management tool, dicamba, to cotton growers. Experiments were conducted at the University of Arizona Maricopa Agricultural Center to evaluate the control of annual morningglory and Palmer amaranth in DGT cotton and in weed studies using dicamba, glyphosate, glufosinate and tank mixtures of these herbicides. In the cotton studies, pendimethalin at 0.95 lb ai/A was applied PPI and prometryn (1.6 lb ai/A) was applied at layby. Sequential applications at 2 leaf cotton and 9 node cotton growth stage of dicamba (Engenia) at 0.5 lb ae/A and glyphosate (Roundup PowerMax) at 1 lb ae/A tank-mixtures resulted in complete control of annual morningglory and glyphosate susceptible Palmer amaranth. A sequential application of glyphosate at 1.5 lb ae/A followed by the dicamba+glyphosate (0.5+1.0 lb ae/A) tank-mixture similarly resulted in excellent control of annual morningglory and glyphosate susceptible Palmer amaranth. A tank-mix application of glufosinate (Liberty) at 0.79 lb ai/A + dicamba at 0.5 lb ae/A at 2 leaf cotton followed by a tank-mixture of Liberty at 0.53 lb ai/A + dicamba at 0.5 lb ae/A at 9 node cotton also provided excellent control of the two weed species. Other sequential application tactics did not provide as much control of the two species by layby. Late season rating of the amount of cotton canopy infested with morningglory found the most infestation in the preemergence Prowl only treatment (96% infestation) followed by the sequential Liberty alone treatment (0.79 followed by 0.53 lb ai/A) (36% infestation). Seed cotton yield was reduced in these two treatments but in all other treatments were both greater and not significantly different from each other. In the weed studies, dicamba at 0.5 lb ae sprayed alone did not kill all of the larger Palmer amaranth and annual morningglory plants whereas tank-mixtures with either glufosinate or glyphosate did result in nearly complete control. As expected, the dicamba alone plots also had greater grass weed populations. In summary, dicamba will be a useful weed control tool for Arizona cotton growers, particularly those spraying glyphosate resistant Palmer amaranth populations. Mccloskey, W. B., & Wang, G. S. (2016, March 7 - 10). Herbicide Tolerance of Direct-Seeded Guayule (Parthenium argentatum).. In Western Society of Weed Science Annual Meeting , 69, 69-71. Guayule, Parthenium argentatum (Gray), is a xerophytic shrub native to the Chihuahuan desert that produces natural latex. Guayule rubber and Hevea rubber have the similar physical and structural properties and can be used to make the same products (e.g., tires and latex gloves). Guayule production in the 2000s started with transplanting 5 to 8 leaf guayule seedlings into fields.Early season weed control was a significant challenge often requiring expensive hand weeding in addition to tillage. The tolerance of guayule to various herbicides was assessed by topically spraying after the transplants were established; plants were typically about 8 inches tall with 20 or more mature leaves when treated. Several section 24c herbicides labels were obtained based on research conducted in 2006 to 2008 including pendimethalin (Prowl H2O), carfentrazone-ethyl (Aim EC), pyraflufen ethyl (ET) and fluazifop-P-butyl (Fusilade DX). Established guayule at this growth stage also appeared to be tolerant to flumioxazin (Chateau) and oxyfluorfen (GoalTender). Recently methods for direct-seeding guayule fields have been developed. Early season weed control will be an even greater challenge than in transplanted guayule fields and may involve spraying herbicides on much younger and smaller seeding. Thus, research was conducted to identify preemergence herbicides that could be used to control weeds in seedling guayule without injuring the crop. Mccloskey, W. B. (2015, March). Efficacy of Long-Term, Preemergence Herbicide Treatments in Arizona Nut Crops.. In Western Society of Weed Science Annual Meeting , 68, Pages 68-69. Mccloskey, W. B. (2015, March). Status of Herbicide Resistant Palmer Amaranth in Arizona - 2014. In Western Society of Weed Science Annual Meeting , 68, Pages 24-25. Mccloskey, W. B., & Bean, T. M. (2015, March). Buffelgrass Control with Imazapyr: Lessons from the Field.. In Western Society of Weed Science Annual Meeting , 68, Page 14. Mccloskey, W. B., Kuepper, A., Patterson, E. L., Nissen, S. J., & Gaines, T. (2015, March). Population Genetics of Glyphosate-Resistant Palmer Amaranth.. In Western Society of Weed Science Annual Meeting , 68, Page 41. Bean, T., & McCloskey, W. B. (2014, March). Buffelgrass control with Glyphosate, Clethodim, Imazapic and imazapyr.. In Western Society of Weed Science , 67, 39. McCloskey, W. B. (2014, February). Glyphosate and pyrithiobac resistant Palmer amaranth in Arizona. In Weed Science Society of America . McCloskey, W. B. (2014, March). Discovery of Glyphosate Resistant Palmer Amaranth in Arizona. In Western Society of Weed Science , 67, 84-85. Bean, T., & McCloskey, W. B. (2013, March). Effectiveness of Glyphosate Tank Mixtures with Clethodim or Imazapic for Control of Buffelgrass (Cenchrus ciliaris). In Western Society of Weed Science , 66, 63-64. Brown, L., Ellsworth, P. C., Fournier, A. J., McCloskey, W. B., & Dixon, W. (2013, January). Measuring Up! Involving Stakeholders in Assessment of an Industry's IPM Revolution. In 2013 Beltwide Cotton Conferences . McCloskey, W. B. (2013, March). Recognizing and Diagnosing Herbicide Injury Symptoms. In 47th Western Pecan Growers Association , 47, 18-20. McCloskey, W. B., & Brown, L. M. (2013, January). Glyphosate Resistant Palmer Amaranth in Arizona. In 2013 Beltwide Cotton Conferences , 1036-1039. McCloskey, W. B., & Brown, L. M. (2013, March). Discovery of Glyphosate Resistant Palmer Amaranth in Arizona. In Western Society of Weed Science , 66, 84-85. McCloskey, W. B., & Dana, B. (2013, February). Buffelgrass Susceptibility to Glyphosate and Graminicides in Greenhouse and Field Studies. In Weed Science Society of America . McCloskey, W. B., Pastor, B. C., & Backer, D. (2013, March). Investigating Herbicide Mixtures for Buffelgrass Management. In Western Society of Weed Science , 66, 13-14. Bean, T. M., McCloskey, W. B., & Casady, G. (2012, March). Efficacy of Imazapic and Glyphosate Mixtures for Postemergence Control of Buffelgrass. In Western Society of Weed Science , 75, 71-72. McCloskey, W. B. (2012, January). Innovations in Cotton Weed Management. In California Weed Science Society , 64, 51-55. McCloskey, W. B., & Backer, D. (2012, February). Buffelgrass (Pennisetum ciliare) Sensitivity to Glyphosate and Graminicides: Greenhouse Experiments. In Abstracts of the Weed Science Society of America . McCloskey, W. B., & Backer, D. (2012, March). Efficacy of Graminicides and Glyphosate Mixtures on Buffelgrass: Greenhouse Studies. In Western Society of Weed Science , 65, 21-22. McCloskey, W. B., Schroeder, J., & Richardson, J. M. (2012, March). Preemergence Herbicides and Weed Management in Southwestern Pecans. In Western Society of Weed Science , 65, 106-107. Bean, T. M., McCloskey, W. B., & Casady, G. (2011, March). Efficacy of Imazapic and Glyphosate For Pre- and Post-emergence Control of Buffelgrass. In Western Society of Weed Science , 64, 19. McCloskey, W. B., & Peterson, V. F. (2011, March). Arrowweed (Pluchea sericea) Management in Arizona Irrigation Districts. In Western Society of Weed Science , 64, 25-26. McCloskey, W. B., Mcreynolds, K. H., Foster, E., & Arthun, D. (2011, February). Russian Knapweed Management in Southwestern Abandoned Pastures. In Weed Science Society of America Annual Meeting . McCloskey, W. B., Prather, T., & Lass, L. W. (2011, March). Classification of Annual Versus Perennial Grasses in Rangelands: A First Step Towards A Landscape Decision Tool. In Western Society of Weed Science , 64, 110-111. Mccloskey, W. B., & Backer, D. (2017, February). Buffelgrass Susceptibility to Herbicides in Greenhouse Experiments. . 57th Annual Meeting of the Weed Science Society of America. Tucson, AZ: Weed Science Society of America. Mccloskey, W. B., Molin, W. T., Jugulam, M., VanGessel, M. J., & Hoagland, R. E. (2017, February). Survey of the Genomic Landscape Surrounding the EPSPS Gene in Glyphosate-Resistant Amaranthus Palmeri From Geographically Distant Locations. . 57th Annual Meeting of the Weed Science Society of America. Tucson, AZ: Weed Science Society of America. Mccloskey, W. B. (2015, January). Occurrence and Management of Herbicide Resistant Palmer Amaranth in Arizona . Cotton Weed Science Research Conference at the Beltwide Cotton Conferences. San Antonio, TX: National Cotton Council of America. Mccloskey, W. B. (2018, February). Palmer Amaranth Response to Glufosinate - Auxin Herbicide Mixtures . 58th Annual Meeting of the Weed Science Society of America. Arlington, Virginia: Weed Science Society of America. Mccloskey, W. B. (2018, January). Auxin Herbicide - Glufosinate Interactions on Palmer Amaranth Control . Cotton Weed Science Research Conference at the Beltwide Cotton Conferences. San Antonio, TX: National Cotton Council of America. Mccloskey, W. B., & Norton, E. R. (2018, March). Desert Cotton Sensitivity to 2,4-D and Dicamba . 71th Annual Meeting of the Western Society of Weed Science. Garden Grove, California: Western Society of Weed Science. Mccloskey, W. B., Richardson, J. M., & Mann, R. K. (2018, March). Weed Management in Western Pecans with Penoxsulam+Oxyfluorfen . 71th Annual Meeting of the Western Society of Weed Science. Garden Grove, California: Western Society of Weed Science. Mccloskey, W. B. (2017, March). Mixtures of Glufosinate with 2,4-D or Dicamba for Cotton Weed Management. . 70th Annual Meeting of the Western Society of Weed Science. Coeur d'Alene Resort: Western Society of Weed Science. Wang, G. (., McCloskey, W. B., Bronson, K., Thorp, K., & Ray, D. T. (2013, July 22-25). Lesquerella Yield and Oil Quality Response to N Fertilizer Rate and Irrigation . ASHS Annual Conference. Palm Desert, California: American Society for Horticultural Science.